(Oklahoma City, October 12) — NETworks Presentations, LLC, Warner Bros. Theatre Ventures and Unique Features, bring the Broadway musical ELF to the Civic Center Music Hall in Oklahoma City. OKC Broadway announced that tickets will go on sale beginning this Friday, October 14 at 10AM for all performances December 27th through the 31st. 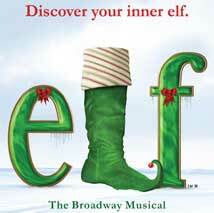 ELF THE MUSICAL will play Tuesday and Thursday at 7:30pm, Wednesday, Friday and Saturday at 2pm and 7:30pm. For tickets please visit OKCBroadway.com or call 405-297-2264. Groups of 10 or more may call (405) 297-1575. NETworks PRESENTATIONS, LLC (Producer) from its inception nearly 20 years ago has been an industry leading producer and manager of touring musical theatre productions and remains committed to delivering quality entertainment to audiences worldwide. Having toured over 60 productions throughout North America, NETworks is now expanding its tours into international markets including South America, Greece, Italy, Turkey and South East Asia. Current touring productions include Cameron Mackintosh’s The Phantom of the Opera, Dirty Dancing, Elf the Musical, Finding Neverland, Into The Woods, Once the Musical, The Sound of Music and Rodgers & Hammerstein’s The King and I.